Months after the United States showed footage of its new weapons defense system, a laser cannon capable of shooting down drones and hostile aircraft, China introduced one of its own. Supposedly, the Chinese military has created a laser weapon system that has short-range capability and is able to shoot down a UFO and ward off a drone attack, according to a Vida Latino news report. The China Academy of Engineering Physics (or CAEP) released a statement Sunday about the development of a “highly accurate laser gun that can disable light-weigh drones and UFOs breaching its airspace.” Reportedly, the device has a range 1.2 miles, according to the report. 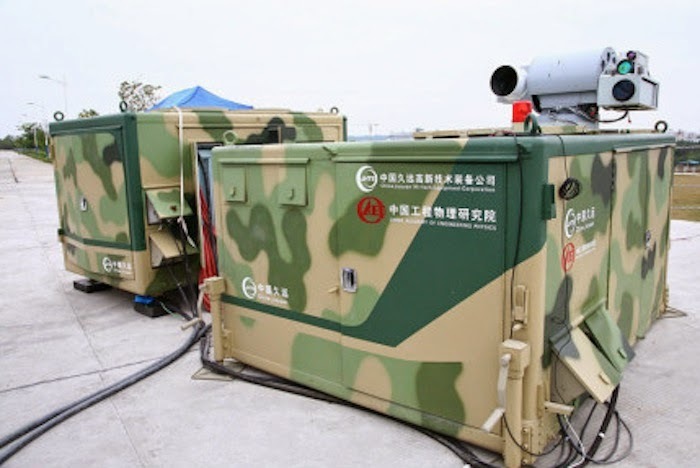 To bolster its claims of the laser weapon’s capability, China officials showed the results of a demonstration; the Xinhau News Agency for the People’s Republic of China released images of large camouflaged metal boxes. They juxtaposed them with pictures from the wreckage of a purported compact drone which was in flames. China’s laser-guided weapons systems was developed to “play a key role in ensuring security during major events in urban areas” and respond to “unlicensed mapping activities,” this according to the state-run press agency. The current hardware has limited capability and is only effective for slower-flying drones and unidentified flying objects with maximum speeds 112 mph. China’s robust military plans to use the new laser weaponry to target unmanned UFOs of commercial construction that can be modified and used as weapons by terror groups. Yi Jinsong, a manager with China Jiuyuan Hi-Tech Equipment Corp. explains. The compact laser guns were tested with “100 percent accuracy,” and are said to have recently shot down nearly three dozen drones. Officials say the cannons can be installed on terrain vehicles and deployed in theater. Reportedly, larger and more robust systems are in development, but that information remains classified. Some say the timing of China’s new laser weapons is suspect, and comes on the heels of the West release compelling footage of its Naval fleet capability to shoot down large aircraft over greater distances — all at a cost of $1 per use. Reportedly, like its Russian ally, China is supposedly in a quiet arms race on Earth and in space with the United States. It’s unknown if the latest report was propaganda or part of the flow of information expected in new technology releases. Should the Obama Administration be worried about this latest development?